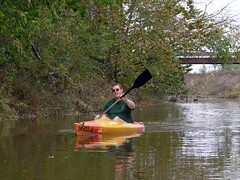 Dianne and I visited The Thomas Restaurant for the first time on our recent Spring River Paddling Trip. We had a great meal there and loved the cool old 50's decor. It was a uniquely beautiful landmark and homage to a gentler time before the clowns took over the cafes. In addition to the cool neon sign, the outside had this distinctively ornate iron work that looked to me like it was made from re-bar. I would love to hear the story behind that. I just heard on the news that it burned down. What a sad loss. That is excellent news! Thanks for stopping by to let us know.